Delhi, as often believed, is a city of many citadels. These citadels faced destruction time and again, but each rose like a phoenix, glorious in its resurrections. One of the many surviving relics of that legacy is the citadel of Feroz Shah Kotla, built in the 14th century by the last Tughluq emperor as part of his city, Firozabad. Apart from being a stunning monument in itself, Feroz Shah Kotla embodies elements that continue to intrigue. The first element is the elegant Ashokan Pillar that was brought from Topra under the wish of the emperor himself, thus giving modern-day viewers a glimpse of the ancient within the medieval. The other, equally appealing element is the worship of djinns every Thursday by hordes of people who believe in the magic of the supernatural. 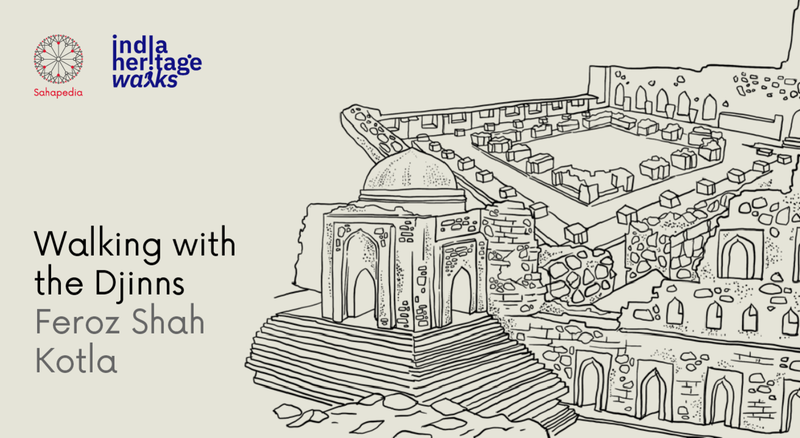 This walk intends to give its participants a chance to experience the magic of Feroz Shah Kotla, and understand why Delhi has famously been called The City of Djinns. The walk will cover important sites within the monument, including the Ashokan Pillar, and finally, the participants will be taken through sites where the djinns are worshipped. We will end the walk with a 15-minute short interactive session, where participants will narrate a story of their own as they are situated in the monument. She is a PhD. Research Scholar in History at Ashoka University. She specializes in pre-colonial history, archaeology, heritage, and conservation. She completed her BA Honours in History from Presidency College Calcutta and her Masters and MPhil in Ancient Indian History from Delhi University. She has been a Sahapedia Project Fellow in 2017-2018. Entry fees of Rs. 20/- for Indian nationals and Rs. 100/- for foreign nationals to the monument, along with separate entry fees for the museum, are to be purchased by the participant. The walk leader can also speak Hindi and Bengali if required. Parking facilities are available outside the complex. Please wear comfortable shoes and carry drinking water. The walk is open only to those who are 15 years and above.